A cautionary tale about Hollywood eating its young, Inside Daisy Clover has a limited message and takes forever to deliver it. A running time of over two hours strangles momentum as characters lurch from one overblown crisis to another, the childish innocence of the main character not helping to fill the central emotional void. It's the 1930s, and fifteen year old Daisy Clover (Natalie Wood) is from the wrong side of the California dream, a tomboy who loves to sing but is stuck forging star signatures and living with her eccentric mother (Ruth Gordon) in a dilapidated seaside mobile home. Daisy comes to the attention of arrogant Hollywood producer Raymond Swan (Christopher Plummer), who sees enough potential and adopts her into his star-making machine, but also insists that her mother be committed to a mental institution. 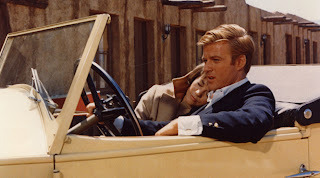 The pressures of stardom both enthral and unbalance Daisy, and she soon falls under the spell of Wade Lewis (Robert Redford), another manufactured star in the Swan stable. Despite her young age a stuttering romance develops between Daisy and Wade under Swan's watchful eyes. But Daisy has plenty to learn, and the mental pressure mounts with revelations involving Wade's sexuality, her mother's forced incarceration, Swan's wife Melora (Katharine Bard), and Swan's malevolent intentions. At 28 years old, Natalie Wood, who's own real life story had a few parallels with Daisy, does her best to play a starstruck 15 year old, but there is never any doubt that Daisy is portrayed by a much older actress interpreting what it meant to be young and poor in the Depression. Wood rolls her eyes, wrinkles her nose, and pulls-off some teenage tomboy mannerisms, but the performance represents capable acting at its most basic, and the lack of depth at the movie's core compromises any potential engagement. The rest of the cast take their roles and run to extremes. Christopher Plummer is the obnoxiously self-obsessed studio head, and to him actors are money machines to be exploited until empty, at which point it's time to activate another machine. He does not fail to give Daisy the encouragement that she needs to launch into stardom, but is also quick to exploit and dispose of his stars as necessary. Robert Redford wanders into the movie spouting mostly incomprehensible psychology, seduces Daisy, waltzes off again before re-emerging as one of Hollywood's first relatively sympathetic bisexual characters. Wade Lewis never sticks around long enough for his character to be anything other than an intermittent stir-stick. Meanwhile, it's not clear what the character of Melora Swan was really doing in the movie, other than to drive home the point that Hollywood is filled with concealed victims. Ruth Gordon was nominated for an Academy Award (and won the Golden Globe) for her turn as Daisy's happily halfway-demented mother, and the accolades surely had a lot more to do with welcoming Gordon back to the screen after a 22 year absence than any genuine bedazzlement by a stock portrayal of an eccentric character. Director Robert Mulligan pulls out one terrific scene, Daisy reaching a tipping point trying to dub over her own singing voice in a sound booth. But otherwise the movie offers little in the form of stylistic interest to tide over its interminable length. Inside Daisy Clover covers a mildly interesting two year period in a young starlet's life, and appears to last as long.